The San Nazaro in Brolo, seen from the rear. Saint Ambrosius (ca. 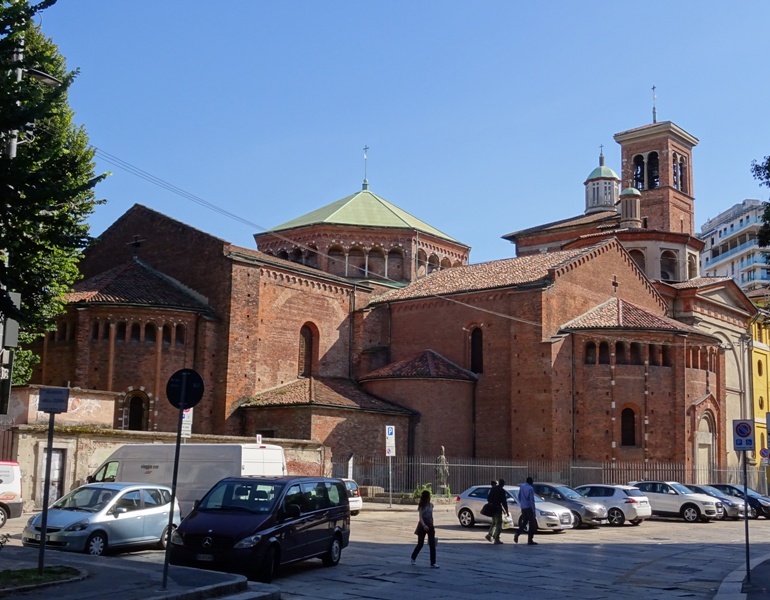 340-397) is credited with founding three or four churches in Milan in the late fourth century. The Basilica Martyrum (now the Sant’Ambrogio) was one of them, the Basilica Virginum (now the San Simpliciano) another. The third church was the Basilica Apostolorum, or the Basilica of the Apostles. 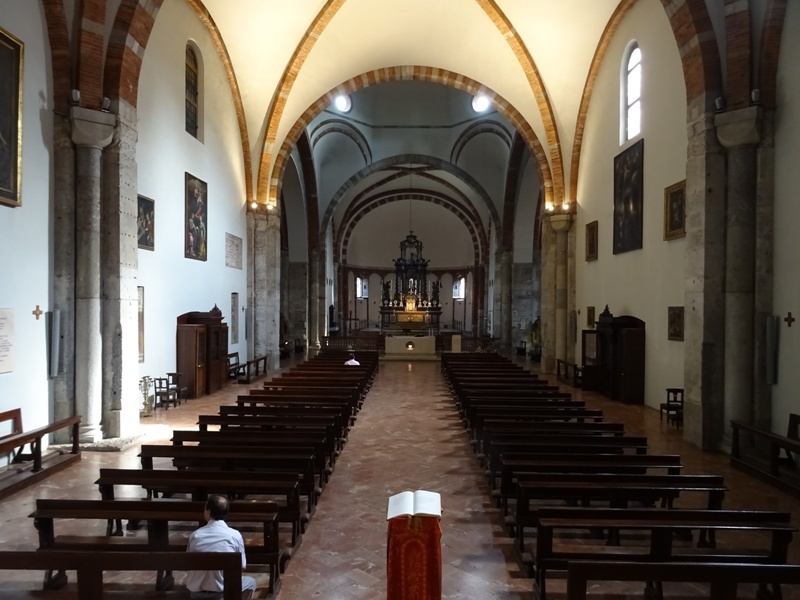 This church is now known as the San Nazaro in Brolo or the San Nazaro Maggiore. It is located in a piazza on the Corso di Porta Romana, which was the road from Milan to Rome in Late Antiquity. Tradition dictates that the San Nazaro was built by Saint Ambrosius between 382 and 386. It was called the Basilica of the Apostles because it held and still holds the alleged remains of the apostles Andrew, John and Thomas. As with all of the churches attributed to Saint Ambrosius, the San Nazaro was built outside the city walls. It was located on the grounds of an old cemetery, and cemeteries are excellent places for digging up new martyrs. In the last years of his life, Saint Ambrosius discovered the bodies of the rather obscure Saints Nazarius and Celsus here, had them exhumed and then ordered them to be brought to the Basilica of the Apostles where they were laid to rest. The church was later renamed the San Nazaro, in honour of Nazarius, of whom nothing is known and who may not have existed at all. The church was renovated and modified on multiple occasions after its completion. It was badly damaged by a fire in 1075 and was subsequently rebuilt using much of the original building materials. As with the San Lorenzo Maggiore further to the west, it is worth the effort to walk around the church to admire the chapels, apses, dome and campanile (see the image above). The best place to observe the whole structure is probably the small public park behind the church, next to the so-called Ca’ Grande, the city’s first major hospital and now part of the University of Milan. It must be said that the view from the rear is actually much better than the view from the front. That is because the view of the original facade of the San Nazaro is blocked by the huge Trivulzio chapel that was built in front of it. Visitors enter the church through this chapel, which is square on the outside, but octagonal on the inside. The chapel was designed and executed by Bramantino (ca. 1465-1530), a pupil of Bramante, and completed by Cristoforo Lombardo. Interior of the Trivulzio chapel. Work on the chapel seems to have taken quite some time. Bramantino started the project in 1512 and the chapel was presumably only completed by Lombardo in the 1540s. 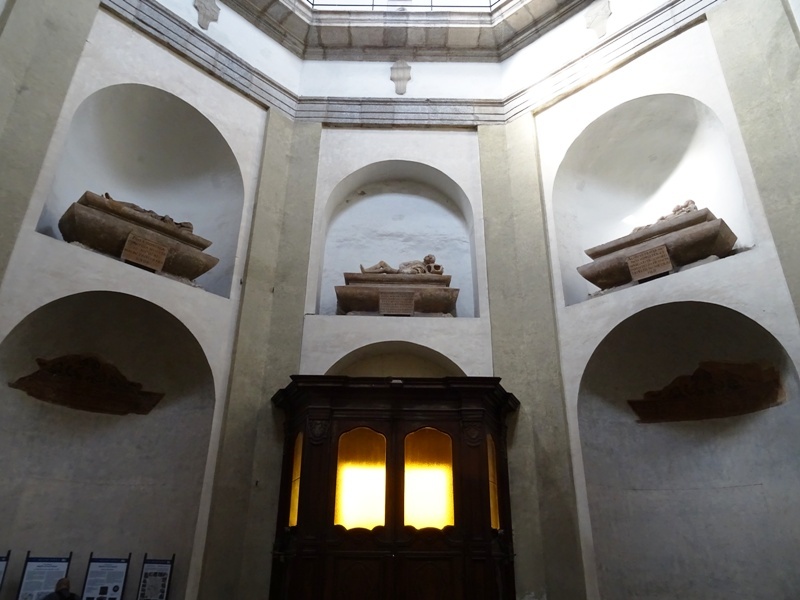 It was intended as a mausoleum for members of the influential Milanese Trivulzio family and commissioned by the nobleman Gian Giacomo Trivulzio (ca. 1440-1518), whose tomb can also be found here. All the tombs have been placed in niches, at a height of some 4-5 metres. Neither the Trivulzio chapel, nor the other chapels in the church, nor the church itself are particularly beautiful. The interior of the church and of the chapels is rather plain, simple and functional. Breath-taking decorations are lacking. 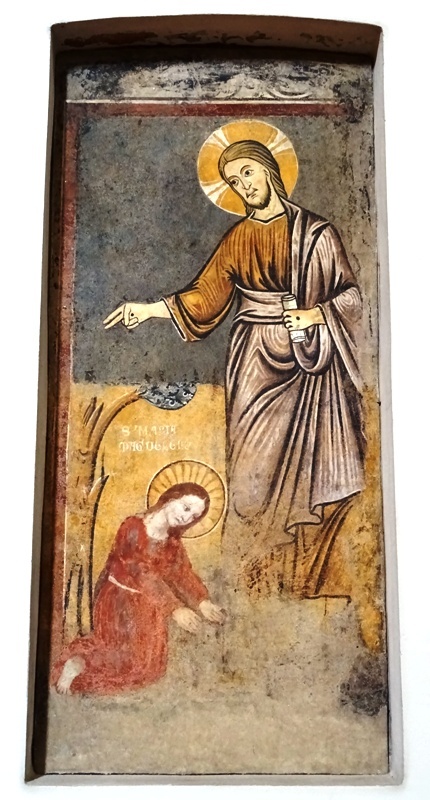 The church does have a few old and somewhat damaged frescoes on the walls that date back to the fourteenth and fifteenth century. 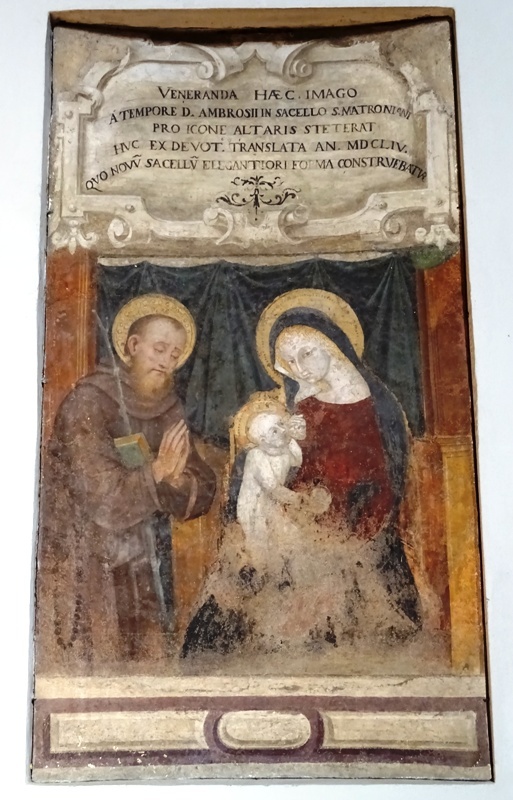 One of them shows a Madonna and Child and the Milanese hermit San Matroniano, a contemporary of Saint Ambrosius. An inscription above the fresco mentions that the fresco was moved from a chapel dedicated to San Matroniano to the nave in 1654. Also present in the San Nazaro are a few tiny fragments from an inscription about the founding of the church, attributed to Ambrosius himself. The San Nazaro has an impressive pipe organ as well. 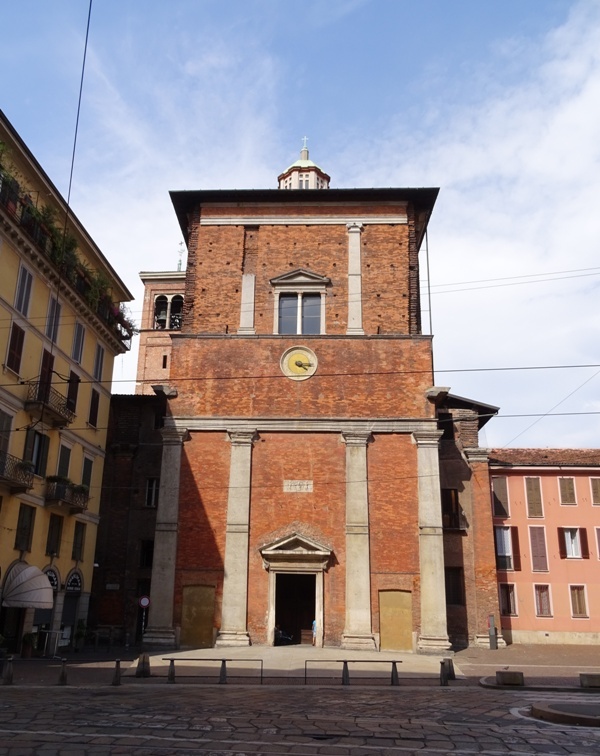 Of particular interest is the Cappella di Santa Caterina d’Alessandria, the chapel dedicated to Saint Catherine of Alexandria. Catherine, usually depicted with a spiked wheel, was a Christian woman who defeated fifty pagan philosophers and orators during a theological debate organised by the emperor Maxentius (306-312). In doing so, she caused many of her opponents to convert to Christianity themselves. Afterwards, Maxentius had her tortured and condemned to death on the breaking wheel, which broke into pieces as she touched it. The emperor then had her decapitated. Unfortunately for devout Christians, the story is complete rubbish, for many reasons. Maxentius was not involved in any persecutions of Christians. He was a usurper who ruled a part of the Western Empire from Rome, not Alexandria. He probably never set foot in that city, which was in any case way beyond his sphere of influence. The thought that a pious teenager can defeat fifty learned opponents in a debate just sounds too good to be true. Stories like this make sense in the realm of religion, but cannot even remotely be considered historical. 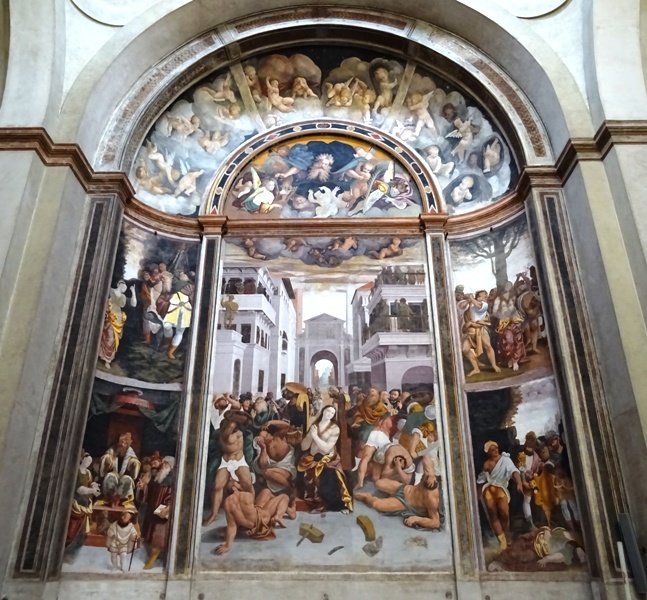 The chapel was designed by Antonio da Lonate (1456-1541) and frescoed by Bernardino Lanino (ca. 1511-1578). The frescoes are about Saint Catherine’s martyrdom. In the centre fresco, a very pale looking Catherine is shown half-naked and praying. On the ground before her are fragments from the spiked wheel, which had been blown to smithereens when she touched it. The scenes on the left and right show other episodes from Catherine’s life and relate to her attempts to stop the persecution of Christians, her execution and her death. A ‘brolo’ is apparently an ‘old walled-in garden’.